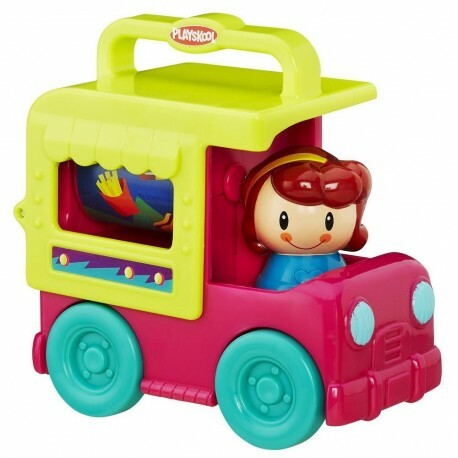 Keep your little one entertained almost anywhere you roll with colorful, freewheeling fun! This adorable car toy for toddlers can engage them in active, imaginative play while promoting key developmental skills. Rolling the truck around can help teach concepts such as forward and backward or stop and go. This kind of play also provides opportunities to build gross motor skills as kids use full-body movement and muscle strength to push the truck along. Little hands can also open the truck to bat the spinner and turn the friendly figure to make it click, which can also encourage fine motor skills. To make things easier for families, this truck can fit in many diaper bags, and comes with no loose pieces to keep the play contained in one place. It's as easy as play, stow, and go! •Includes 1 Fold 'n Roll Trucks toy.